Please note this article was first published in 01 Jul 2010. Its content may now be out of date. We recommend taking a look at more recent website building blog posts or check out our comprehensive support pages. If you are looking for information on our 14 day free website builder trial we have a large number of webpages that guide you throug the process. Place your business on Google Maps. A free listing on Google Maps can make it incredibly simple for your existing and potential customers to find you very quickly. When customers search Google Maps for local information and companies, they can find your business, along with your address, hours of business, parking info, product / service information and even photos of your storefront or products. It's really easy to set up and even better ….. it’s FREE! You use Google Places to create your free listing and once you’ve signed up you get all sorts of extra benefits and tools including the facility to manage your business information, Post coupons and live updates and you can see how you're doing with your very own performance dashboard. In addition to your Address and contact details, you can specify categories, payment options, business hours, service areas, and much more. How to get your business on Google Maps. To start with, you’ll need to log into your Google Account. You should already have an account from when you verified your domain with Google via your DotGO Website control panel. If not, simply set one up now. 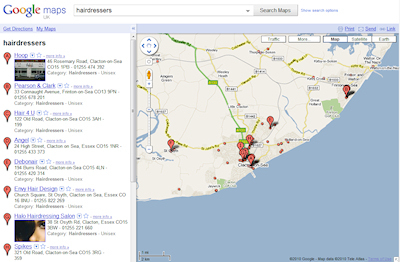 Once you’re logged in, click Maps (top left) and click the link, which says “Put your business on Google Maps”. Then click: Add Another / New Business. Simply follow the steps and enter all the information you have about your business to get the very best advantage. As you enter all your business information you can watch your Listing take shape over on the right of the page. The second page offers the option to enter extra information, such as your opening hours, payment options and categories. You can also upload up to 10 images in this section too, so upload your logo and any other clearly relevant images you have, which best describe your business, products or services. You can also add any other information here such as the brands you stock or the main services you offer or pretty much any other details, which you feel will encourage that all important response from potential customers. The last thing you’ll be asked to do is to validate your listing, which is done by either phone or sms. Choose whether you’d like to receive a phone call or have a text message sent to a mobile and then Click Finish. You’ll be taken to your new Google Places Dashboard and you’ll receive a call or text with a code, which you’ll be asked to enter into your dashboard. Google will then create your listing in Google Maps and some other related Google services. Your dashboard allows you to update and manage your listing. Choose what information emails you’d like to receive from Google about updates, news, offers, research etc and Click Save. Once your listing is validated, you can see its activity on simple charts. See your top search queries and Post news and messages to customers. Please remember, this article was first published 01/07/2010. The content may be out of date and you cannot post comments any more. Please check out our new blog.